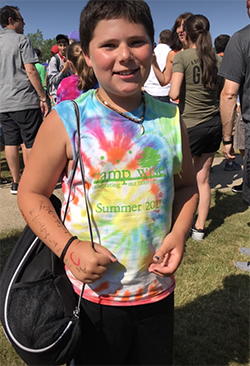 Gabe Feinberg, 12, returned from Camp Wise in Claridon Township wearing a tie-dyed t-shirt and telephone numbers written on his arms to stay in touch with friends. For Michelle and Sam Feinberg of Pepper Pike, this hurdle emerged when their son, Gabe, 12, asked if he could spend his summer at the Mandel Jewish Community Center's Camp Wise in Claridon Township, where children entering grades two through 11 enjoy horseback riding, daily swimming lessons and Shabbat with friends. With assistance from the Michael and Anita Siegal One Happy Camper Program, the Feinbergs, who belong B'nai Jeshurun Congregation in Pepper Pike, were able to transform their son's dream into a reality. "I think the cost of going to an overnight camp is extremely high, especially when you have multiple kids going," Michelle Feinberg said. "Having (the program) is really helpful for the parents and I think that there are kids who would never be able to go to camp without that and that really helped us be able to send Gabe to Camp Wise." The program began in June 2014 with a $1.25 million endowment from Michael and Anita Siegal of Beachwood. Designed to provide need-blind grants of up to $1,000 for first-time Jewish overnight campers attending a Jewish overnight camp for at least 19 days and entering grades four through 12, the program is in partnership with the Jewish Federation of Cleveland, as well as the Foundation for Jewish Camp and the Jewish Education Center of Cleveland. In 2017, the program awarded 358 grants to help children in Greater Cleveland attend Jewish overnight camp and hopes to help 365 this year, according to Maya Holtz Groys, director of scholarships and grants for the Jewish Education Center of Cleveland in Cleveland Heights. Through the grant, Gabe was able to enjoy three weeks in the village of Ohalim, one of Camp Wise's five villages, for rising sixth and seventh-grade campers. "(Gabe) had the time of his life," Feinberg said. "He really liked all the different activities: the horseback riding, the ropes course and just time being spent with his friends in the cabin. He made a lot of friends from other schools in the area, and he really liked getting to bond with the campers and counselors and do group activities he loved." As a child, Michelle Feinberg attended the Mandel JCC's Anisfield Day Camp in Claridon Township, while her husband, Sam, spent his summers at Camp Ramah, a Jewish overnight camp in Ontario, Canada. Feinberg said she wanted Gabe, a sixth grader at Brady Middle School in Pepper Pike, to have a Jewish camp experience just as she and her husband experienced because of the importance of children identifying with being Jewish beyond religious school and celebrating their Jewish roots. "It was such a good experience and I think that being able to offer something like this is truly unique," Feinberg said. "It just helps so many kids go to camp, and for kids who otherwise wouldn't be able to go, this is a great opportunity and we're very lucky to have that in our community." mgroys@jecc.org or 216-371-0446 x 233.